COLLEGE STATION, Texas—The Texas A&M Foundation announced that it will make $90.8 million available to Texas A&M University as a result of donations by former students and other supporters during the past fiscal year. The funds are a combination of this year’s gifts intended for immediate use as well as endowment earnings from gifts of previous years. This year, the Foundation will make $90.8 million available to Texas A&M University for students, faculty, facilities and programs. Each year, the Foundation makes millions of dollars available to Texas A&M for student scholarships and graduate fellowships, faculty chairs, research, construction, college-based programs and student activities. Many donors direct the purpose of their gifts to areas that are meaningful to them and will advance the university. The Foundation’s net assets, which include land and other non-cash assets, increased 14.8 percent during the past fiscal year to $1.79 billion. By focusing on endowments, the Foundation maximizes growth through asset allocation of the gift principal. Its long-term investment strategy is designed to ease the effects of severe marketplace changes to provide steady endowment payout over multiple years and to preserve the original gifts. During the past fiscal year, the Foundation also recorded $134.2 million in contributions, many of which are endowed funds that will support Texas A&M in perpetuity. Foundation President Tyson Voelkel noted that all contributions count toward the university’s “Lead by Example” campaign, which seeks to raise $4 billion by 2020. “Our inspiring supporters enhance and enable excellence at Texas A&M University,” said Voelkel, a 1996 graduate of Texas A&M. 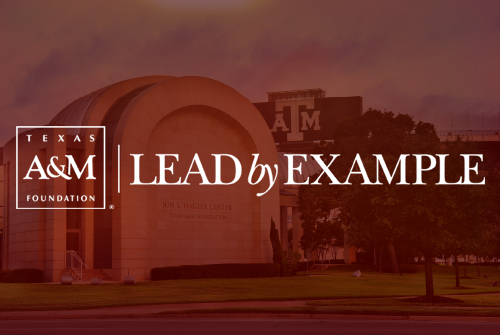 The “Lead by Example” campaign is a joint effort between Texas A&M and its affiliate organizations: the Texas A&M Foundation, The Association of Former Students, the 12th Man Foundation and the George H.W. Bush Presidential Library Foundation. It is the largest higher education campaign in Texas history and the third largest conducted nationally by a public university. The Texas A&M Foundation is a nonprofit organization that unites generosity and vision to raise and manage major endowed gifts that support the future of Texas A&M University. For additional information and for photographs, please contact Molly Kulpa at mkulpa@txamfoundation.com or (979) 845-7463. Launched in 2015, Texas A&M University’s third comprehensive fundraising campaign, “Lead by Example,” is a joint effort between Texas A&M and its affiliate organizations: the Texas A&M Foundation, The Association of Former Students, the 12th Man Foundation and the George H.W. Bush Presidential Library Foundation. With a goal of reaching $4 billion by 2020, it is the largest higher education campaign in Texas history and the third largest conducted nationally by a public university. The campaign will generate gifts in three major areas: Transformational Education; Discovery and Innovation; and Impact on the State, Nation and World.